I recently completed binge watching the entire 10 episodes of Making a Murderer on Netflix. One of the concluding remarks from Steven Avery’s defense team was regarding whether there are new technologies available to better detect EDTA levels or other DNA tests. There was an obsessive fixation on finding more sensitive methods of detecting EDTA in the blood. In my opinion, even if there are new technologies in 2015/2016 to more accurately detect EDTA levels it would not be introducing new evidence. What if there was a way of time stamping DNA using technology and methods that were not available in 2005? In other words, a method that can distinguish between the DNA from the blood vial from the 1996 version of Steven Avery (aged 34) and the DNA from the blood found in the RAV4 car from the 2005 version of Steven Avery (aged 43). This would hopefully strengthen or weaken the claim that blood was taken from a 1996 vial and was placed in the Toyota RAV4. The purpose of this post is not to be an insufferable fan-boy amateur detective troll but to share with the world advances in DNA technology and analysis that were not available in 2005 that has a potential to be applied in this case. Disclaimer: This is a very simplistic explanation and any deviation is to ensure that the general public can understand this rather complicated concept. Each cell in your body contains DNA, this has all the instructions to make a human. The DNA is composed of 4 letters A, C, G and T and each cell has 3 billion of these letters (or sites) in total that make up your genome. On average 1/1000 of these sites are different (i.e. there is a different letter) between two individuals. These sites, where the letters are different between two individuals (i.e. mutations) can be used to identify people. Using enough of these sites will accurately distinguish two individuals and also if two samples are from the same individual. This concept was used to identify the DNA from the pubic hair to be from Gregory Allen and was used to exonerate Steven Avery in 2003 for a crime committed in 1985. Almost all of these mutations were inherited from your mother and father, in fact 50% from each. However, over the life time of each cell in your body there is a very, very small chance that a mutation will occur in the DNA. These mutations are called somatic mutations. The majority of these mutations are harmless as it has no biological consequences, while others occur in non-dividing cells or cells that rarely divide and thus have no chance to spread the mutations. A subset of these mutations that have biological consequences and occur in dividing cells may result in cancer. Next Generation DNA Sequencing is a technology that was not available in 2005 and became available and mature from 2007 onwards. This technology allows scientist to read all 3 billion letters (human genome) contained in each of your cells. Prior to 2007, this was not possible to do in an economical and timely manner and has revolutionized the field of human genetics making large population scale sequencing such as the 1000 genomes project and Exome Aggregation Consortium possible. This blog post will concentrate on how accumulations of somatic mutations in DNA can be used to determine the relative age of an individual. This is one of several ways that next generation DNA sequencing can be used to approximate the relative age of an individual at the time of DNA extraction. It expands upon a concept introduced in two articles published in the New England Journal of Medicine (NEJM) by researchers from Harvard. The first published by Genovese et. al. and the other by Jaiswal et. al. in the same December 2014 issue of NEJM. The New England Journal of Medicine is one of the most respected journals in medical research. The concept introduced by Genovese et. al. and Jaiswal et. al. is that over time very, very rare somatic mutations start accumulating and the older the person the more of these mutations that they harbor (Figure 1 from Jaiswal and Figure 2D from Genovese). The number of somatic mutations are very low in younger individuals but it’s important to note that the search was limited to only genes (~1-2% of the genome) or an even smaller subset of genes known to cause blood cancers. Expanding this search to the whole genome will likely yield more somatic mutations (the majority with no biological consequences) and will be more applicable to younger individuals such as Steven’s earlier time points. The DNA extracted from blood are from cells created from hematopoietic stem cells. The somatic mutations that can be detected are from stem cells that have divided multiple times to expand in number. 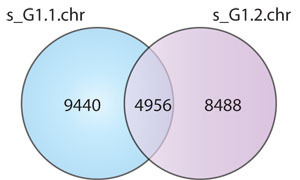 This expansion is necessary to contribute to a higher fraction of DNA with these mutations, which later can be detected by sequencing (Figure 1 form Genovese). The results from both studies, helps to explain the genetic reason why as you age, the risk of getting cancer increases as more time has pass for you to accumulate harmful somatic mutations that go on to cause cancer. A simple analogy would be suppose I am throwing darts at a dart board. I’m pretty bad at darts so the chances of me hitting a bulls-eye is very, very slim. However, if I stand there for a few hours throwing darts, I will eventually hit the bulls-eye. There is also a chance I will never hit the bulls-eye but hey I’m not that uncoordinated! Thus, as you age (hours throwing darts) you are more likely to accumulate somatic mutations that can cause cancer (hitting the bulls-eye). Now let’s apply this concept to blood DNA from various time points in Steven Avery’s life: 1985, 1996, 2005 and the present (Figure Below). Note: Mutation X, Y, Z is use to represent a set of somatic mutations from each of the respective time periods 1985-1996, 1996-2005 and 2005-present. As Steven ages he accumulates somatic mutations relative to his 1985 DNA sample. Blood DNA from his present-self should have all the somatic mutations identified in 1996 and 2005 (i.e. Mutations X and Y) in addition to any new mutations that occurred between 2005-present (i.e. mutation Z). Somatic mutations (i.e. Mutation Y) that occurred between 1995-2005 are UNIQUE to the 2005 version and can be used to distinguish between the evidence blood vial taken from 1996 and the blood found in the Toyota RAV4 in 2005. There are blood samples or DNA extracted from blood for each of the critical time points. I’m assuming during the investigations this was the case. There has been some somatic mutation events (i.e. 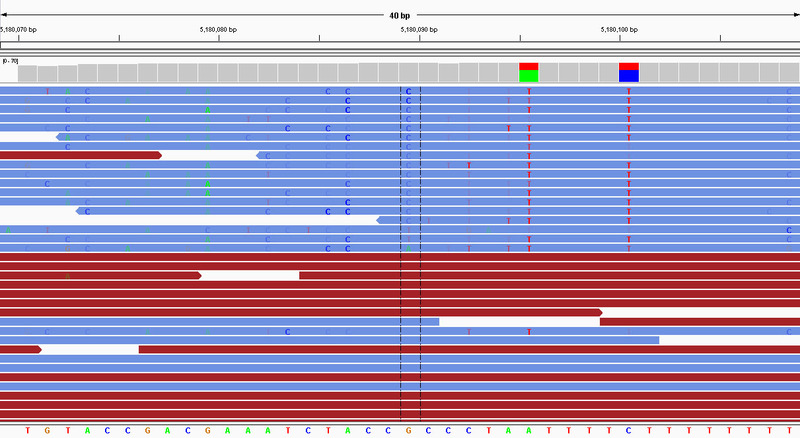 Mutation Y) in Steven’s blood between 1996 and 2005 and can be detected reliably. The quality and quantity of DNA available is sufficient to perform this analysis. This method and technology is robust to some degree of DNA degradation. This method, if applicable would require the development of a test that is robust and reproducible with the appropriate negative and positive controls. The detection limits also needs to be clearly defined. Fortunately, most of this development has been performed by clinical cancer tests. Further development of these tests for this specific application does take time but I have a lot more faith that the time taken by my peers would be far less than the circus of incompetence and stupidity, that is now the US legal system to revisit cases. Disclaimer: These are my own thoughts and opinions and are completely independent to the institutions and universities that I am employed. Any mistakes in science, logical reasoning, grammar/spelling and lack of eloquence, I blame on my lack of sleep from jet-lag and exhaustion from binge watching 10 episodes in 24 hours! And Santa cuz he never gave me awesome writing skillz this year for Christmas! During the Ion Torrent User Group Meeting at ASHG, Rothberg talked about how he would approach the Accuracy challenge. He said he would seek out people who did well at the mathematics olympiad and get them to work on the problem and pay them $5,000. What a cheap skate 😀 He also said that there should be more focus on the actual raw signal processing. Thinking on the same lines, Yanick asked in the comments of a previous post, what contribution raw signal processing made with the accuracy improvements in Torrent Suite 1.5. 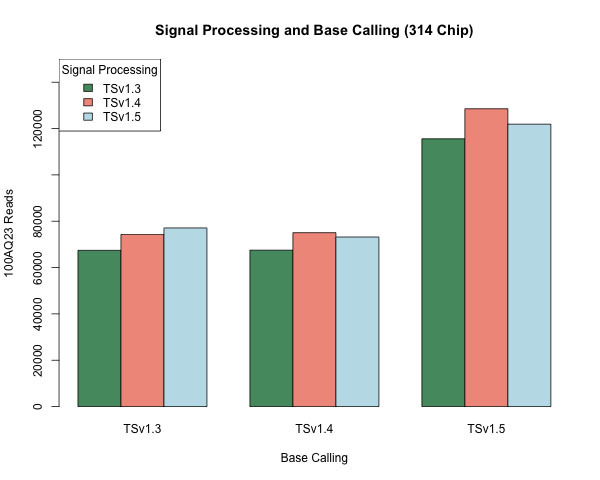 At the moment with the data processing, there is a way to separate the contributions that raw signal processing makes from signal normalization, dephasing and base calling (all three abbreviated to base calling for the rest of this blog). This can be done by using the 1.wells files generated as this marks the end of raw signal processing. Therefore, we can use a version of Torrent Suite to do the raw signal processing and a different version to do the base calling using the –from-wells command line option (Figure 1). Figure 1. Using different versions of Torrent Suite to do signal processing and base calling. 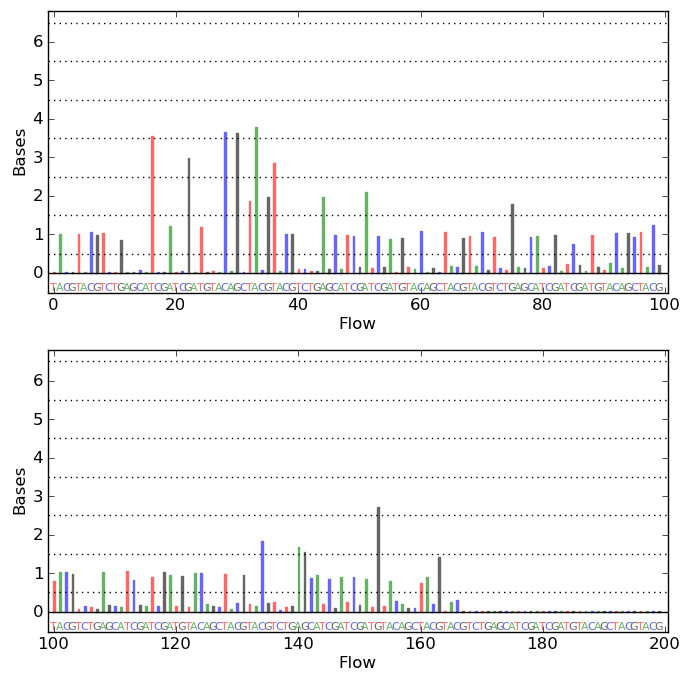 Results grouped along the x-axis by which version did the base calling and colored by which 1.wells file version was used as the input (i.e. what version did the signal processing). Input data is from control library of DH10B sequenced on a 314 chip in our lab (features in a few previous blog posts, including the one on rapid software improvements). This input data was used for each result featured in Figure 1 to make the analysis comparable. In this bar plot the measure of performance is the number of 100AQ23 reads that results – the current measure of accuracy in the Accuracy challenge. The general conclusion is that signal processing changes between versions makes little contribution on accuracy performance. 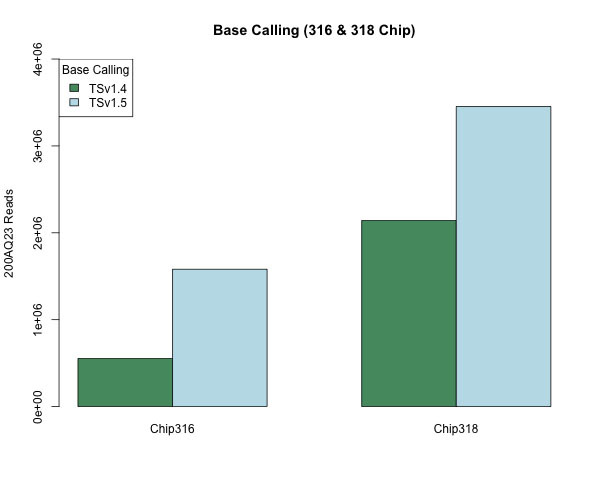 This is evident as there is little difference in heights between bars within each of the base calling groups along the x-axis. In contrast, all 1.wells files which used v1.5 for base calling showed marked improvements regardless of what version of Torrent Suite was used for signal processing (i.e. 1.wells file). Interestingly, the signal processing from v1.4 appears to perform better than v1.5. This can be largely explained by an increase in the number of beads categorized as “live” in v1.4 compared to v1.5. The current signal processing model has reached it’s limit and a new model needs to be developed in order to see further improvements. In this post and last post on software improvements, only 314 data was featured. To give a more comprehensive representation, a 316 (STO-409) and 318 (C22-169) run was used to observe accuracy improvements (Figure 2). Thanks to Matt for supplying the 1.wells file for these publicly released runs. What made the analysis featured in this blog post a little challenging was the 1.wells format changed to make use of the HDF5 standard in Torrent Suite 1.5. 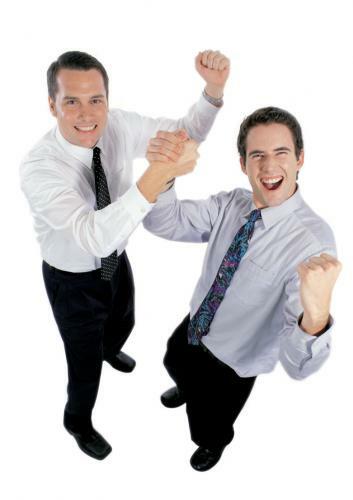 This has allowed for the files to be better organized, parsed and to be compressed by approximately 2-fold. Torrent Suite 1.5 is able to read in 1.wells files generated by previous versions (i.e. backward compatible) but unfortunately vice versa does not apply 😡 I had to write a small program to convert the 1.wells files (from 1.5) back to the legacy format. Kudos to Simon for the tips 🙂 What was a little concerning is the current implementation loads the whole 1.wells into memory which consumes 25-35%, 50-70% of total memory for the 316 and 318 chip. It’s been little over one month and Biolektures has received over 5,000 views. Thank you everyone for visiting and commenting. Now I will rant on and on. I thank the support of established bloggers who have done an amazing job tweeting and mentioning my blog. This includes Nick, Keith, Justin, Lex and Daniel. Thank you for your support and encouragement. I will leave with a link to a short love story of a guy trying to impress a girl with his uber l33t h4x0r skillz featuring Enrique’s Hero.